« What is the Lord’s Table All About? Continuing on this topic of the Lord’s Table, I’ve copied here several more questions and answers from the Heidelberg Catechism. These are succinct, and yet I think very helpful for us. How else to better understand what the Reformed faith has taught about this sacrament than by reading through these confessional statements of faith? What’s more, if we come to realize that our understanding of the Lord’s Supper is different (perhaps very much so) than what the Reformed Church has confessed over the centuries, then this presses us to reckon with why that is so. What do we believe about the Lord’s Supper? Is this even an important question? Is Communion just a memorial service? Is it merely about “remembering” Christ’s death? And is it something we can do individually, when we’re ready to go up and partake? Would a “glorified quite time” best describe what is going on? The Reformed Church has confessed clearly that she believes otherwise. The Lord’s Supper is not just a “memorial” service. It’s not merely about remembering what Christ has done. That’s important to be sure, but there’s more (a lot more) going on. And it’s for our own good as Christians who desire to grow stronger in our faiths and deeper in our sanctification that we value a greater appreciation of this reality. 75. How is it signified and sealed to you in the Holy Supper that you partake of the one sacrifice of Christ on the cross and all His benefits? Thus: that Christ has commanded me and all believers to eat of this broken bread and to drink of this cup in remembrance of Him, and has joined therewith these promises: first, that His body was offered and broken on the cross for me and His blood shed for me, as certainly as I see with my eyes the bread of the Lord broken for me and the cup communicated to me; and further, that with His crucified body and shed blood He Himself feeds and nourishes my soul to everlasting life, as certainly as I receive from the hand of the minister and taste with my mouth the bread and cup of the Lord, which are given me as certain tokens of the body and blood of Christ. 76. What does it mean to eat the crucified body and drink the shed blood of Christ? It means not only to embrace with a believing heart all the sufferings and death of Christ, and thereby to obtain the forgiveness of sins and life eternal; but moreover, also, to be so united more and more to His sacred body by the Holy Spirit, who dwells both in Christ and in us, that, although He is in heaven and we on earth, we are nevertheless flesh of His flesh and bone of His bone, and live and are governed forever by one Spirit, as members of the same body are governed by one soul. 77. Where has Christ promised that He will thus feed and nourish believers with His body and blood as certainly as they eat of this broken bread and drink of this cup? 78. Do, then, the bread and the wine become the real body and blood of Christ? No, but as the water in Baptism is not changed into the blood of Christ, nor becomes the washing away of sins itself, being only the divine token and assurance thereof, so also in the Lord’s Supper the sacred bread does not become the body of Christ itself, though agreeably to the nature and usage of sacraments it is called the body of Christ. 79. Why then does Christ call the bread His body, and the cup His blood, or the new covenant in His blood; and the apostle Paul, the communion of the body and the blood of Christ? Christ speaks thus with great cause, namely, not only to teach us thereby, that like as the bread and wine sustain this temporal life, so also His crucified body and shed blood are the true meat and drink of our souls unto life eternal; but much more, by this visible sign and pledge to assure us that we are as really partakers of His true body and blood by the working of the Holy Spirit, as we receive by the mouth of the body these holy tokens in remembrance of Him;and that all His sufferings and obedience are as certainly our own, as if we ourselves had suffered and done all in our own person. 80. What difference is there between the Lord’s Supper and the Pope’s Mass? 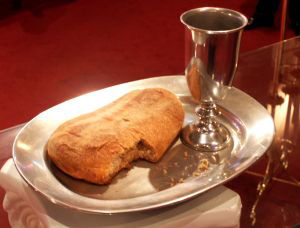 The Lord’s Supper testifies to us that we have full forgiveness of all our sins by the one sacrifice of Jesus Christ, which He Himself once accomplished on the cross; and that by the Holy Spirit we are ingrafted into Christ, who, with His true body, is now in heaven at the right hand of the Father, and is there to be worshipped. But the Mass teaches that the living and the dead do not have forgiveness of sins through the sufferings of Christ, unless Christ is still daily offered for them by the priests, and that Christ is bodily under the form of bread and wine, and is therefore to be worshipped in them. And thus the Mass at bottom is nothing else than a denial of the one sacrifice and suffering of Jesus Christ,and an accursed idolatry. Do you think that the constant misapprehension of this sacred rite is due to the fact that we do not properly understand what it means to be united to Christ? It seems that a Trinitarian understanding of Union is usually ignored by most evangelicals. It appears that those who would hold to a mere symbolic view of the sacrament fail to recognize that the Spirit is the bond that unites us with all of the benefits of Christ’s finished work (since the chief work of the Spirit is creating faith in the believer). I am getting these thoughts from Book III of Calvin’s Institutes, it is here that it becomes utterly apparent that all of Christ’s benefits are absolutely meaningless unless one is united to Christ by the action of the Holy Spirit, who is the bond that unites us to all of the wonderful blessings Christ brings through the gospel. What role does our union with Christ play in this “covenant renewal ceremony” and could the symbolical interpretation of the Lord’s Table be a result of not rightly acknowledging the believer’s union with Christ? So I’ll say two things. 1. You’re absolutely right. Union with Christ has a huge part to play in our apprehension of the Lord’s Supper, and is indeed central to it. Evangelicals generally don’t have a category for ‘union with Christ’ and so (as you’ve rightly pointed out) this is a huge non-starter. Furthermore, I think one can make a case that Evangelicals don’t even have a working understanding of the Trinity either. So you put these two things together and I’m not sure how much of the Lord’s Supper one can salvage. 2. In as much as Union with Christ might help us distinguish problems in Evangelicalism, I think it is only of little value beyond that. For example, Rome, Arminius, and the Federal Vision all would affirm (and some strongly stress) Union with Christ. We see this also in the “Calvin vs. the Calvinists” movement. So, in this way I think the doctrine of Union can also be a non-starter — as sad as that might sound to some. Yes it distinguishes us from Evangelicalism (hence its popular resurgence in some circles), but it hardly helps in the deeper theological formulations essential to Reformed theology. We have to remember (or realize) how far Evangelicalism has gone. She’s left the mother ship. In some ways even Rome is more orthodox in comparison. Reformed Theology, however, (against all these models) has stressed Justification. Luther, Calvin, Owen, Reformed Scholastics, Old Princeton, etc., would say justification is the hinge upon which the Christian religion turns. Even our mystical union is predicated on our justification by faith. Although we are predestined and elect (and thus in Christ forensically and filially) we nevertheless do not experience any vital or mystical union until by faith we are justified and all these benefits become now rightfully (vitally and experientially) ours. Hi, I found your blog through Tim’s. I’ve enjoyed reading your stuff. Answer: The communion in grace which the members of the invisible church have with Christ, is their partaking of the virtue of his mediation, in their justification, adoption, sanctification, and: Whatever else, in this life, manifests their union with him. This pretty baldly says that justification is a manifestation of union with Christ. I don’t think we should get rid of union just because Rome or the federal vision uses it. Justification is indeed that hinge, but doesn’t LC 69 suggest that union is the doorframe to which the hinge is bolted? No, I certainly don’t think we should throw out Union either. The question is how to fit it in our theology without threatening the doctrine of justification sola fide. The way I understand it there are three aspects to our Union with Christ: 1) Decretal 2) Federal/legal, and 3) Mystical/vital/existential. The first two are in existence from all eternity, the last is predicated on faith. Therefore although we were predestined in Christ before the creation of the world (and thus in Union with Christ federally), we were not in Union with Christ existentially until faith came. This, then, would be similar to our doctrine of Election. Are we justified through the instrument of our election? Or by Faith? Clearly Reformed theology has taught the later and not the former. Similarly, Union is not the instrument of our justification but faith is. Thus our vital/existential union is predicated on faith, whereby we are made partakers in all Christ’s benefits. So, in answer to the your question regarding the WLC, I guess I wouldn’t see it as referring to the order of benefits (i.e. Union leading to justification) either temporally or logically. Rather, I see it as speaking of ‘manifesting’ our continuation and renewal in that Union that is already ours. The contexts also is that of Communion which is itself a ‘renewal’ rather than ‘initiatory’ concept. I like the idea of the door-hinge and the door-frame. But then I would push the analogy further and say that the door is not connected to the door-frame except through the door-hinge. And thus any knowledge of vital/existential union (though it may exist decretally) must itself pass through the necessary hinge of justification by faith. Until then, the door-frame remains outside the periphery of our existential experience – and like predestination – shouldn’t be made the locus of our theology. We don’t know we’re elect until faith comes along, and it is the same way with Union. LC handles union first. Union here clearly refers to mystical union (Q&A 66). How does that union come about? Through effectual calling (Q&A 66). The sinner need not be justified to be united to Christ. At this point, LC is saying that the sinner is united to Christ, since the sinner is united to Christ in effectual calling. So God calls us, making us alive, and uniting us to Christ by the Spirit (Q&A 66-67). This is the benefit of union with Christ. Then there is the benefit of communion with Christ in grace, which means partaking of the virtue of his mediation in justification, etc., which I assert once again is a manifestation of, a showing of, union with Christ. I don’t think you can read Q&A 69 any other way: justification shows our mystical union with Christ. Want to know if you’re united to Christ? Ask if you’re justified. Because justification shows, manifests, that mystical union. So, contra to what you said in comment 2, mystical union is decidedly not predicated on our justification, but on effectual calling; at least, this is the case in WLC. Want proof that justification isn’t prior to mystical union? It doesn’t get mentioned until Q&A 70. If LC predicated union on justification, why would it explain justification after it explained mystical union? That would hardly be in keeping with the logical rigor of the catechism’s structure. Incidentally, because I don’t keep up with faddish false teaching these days, I’m not sure where you got the idea that someone was saying that union is the instrument of justification. I certainly don’t hold that – I affirm LC Q&A 73. That’s a whole lot of blessing, including justification, v. 7, all in Christ, which I take to refer to mystical union (other than election in v. 4). God blesses us as we are in union with Christ. But this only makes sense. Jesus was adopted, sanctified, justified, glorified. How could we receive any of those things apart from him? Thanks for pointing this out. It’s helped me look more closely at what I believe. So, if you’re saying our vital union is predicated on faith, then we’re in agreement. My main concern is that we don’t adopt a schema that allows for the existential (and particularly transformative) aspect of union to exist prior to (or behind) faith. I don’t know, but it seems there is this movement which would allow for a transformative union logically (and perhaps temporally) prior to faith. Given this transformative infusion I don’t see how that isn’t tantamount to putting sanctification before justification. If our schema sees “In Christ alone, by grace alone, through union alone”…. I think something is askew. Yeah, this has been good for me too. It’s been a while since I thought about these issues. 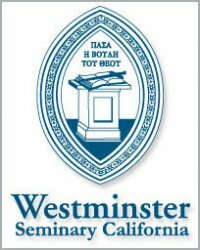 I hear a lot about how WSCal and WTS are diametrically opposed on the issue of union, but I don’t know. You’re saying union is predicated on faith, and “union with Christ by Spirit-worked faith” is the mantra I was taught by Gaffin/Tipton at WTS. I certainly never heard that union could possibly precede faith in any way. Who allows for a transformative union prior to faith? Is that what FV teaches? I confess I’ve never read a word of their stuff. Incidentally, I think WSC 30 fits right in to my understanding of WLC 69. The Spirit applies redemption to us by creating faith, which unites us to Christ in effectual calling, and then through that union is conveyed every spiritual blessing/benefit (WSC 32, which I think corresponds to WLC 69, but in short form). Thanks for the exchange. Keep up the good blogging!